If you do not follow Olympic Sports, you may not have heard about the spectacular 115th Boston Marathon this past Monday. 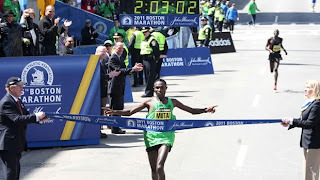 Geoffrey Mutai ran the fastest marathon of all time - a blistering 2:03:02. That beats the previous record of 2:03:59. You can see the second place finisher just seconds slower in the above picture. Technically, the run does not count as a world record because the Boston course is point-to-point with a net elevation decrease. Plus, the day featured a strong tail wind. However, I will tell you as someone who has had the honor to run Boston, the course is not easy. That downhill slope can sap your quads long before the Newton Hills play tricks with your hamstrings. But I think the whole debate on the world record misses the point. This race and its heritage deserves to have memorable runs. The women's race equaled the excitement of the men's, and I know my two friends who ran (one sub 3 hour and the other at 3:15) enjoyed it as if they had actually won it. I did not actually view the finish live. When I got to work, the race was about 10 minutes from completing. Universal Sports Online offered it but only for $4.99 - not for free. Being somewhat of a cheapskate for online videos, I declined to pay that for ten minutes of viewing. Instead, I "watched" the finish via Twitter. How did I do that? Well, I follow a number of runners and running sites on Twitter. Every few seconds, one of them would post an update on the race. Believe it or not, this was actually very exciting to experience. In some ways, this parallels how people "listened" to baseball and other big events prior to radio. Fans would gather at bars and barber shops that had telegraphs. They would receive updates and then post scores and stats on big chalk boards for everyone to see. However, after "hearing" the race, I decided that I wanted to watch the whole thing from the start. So, in the end, I dropped the $4.99 to buy the replay broadcast. Funny, I still wouldn't have traded watching it live for my Twitter experience because it was more like having people I know tell me about the race than strangers on TV. And $4.99 for 3 hours of total content doesn't feel like a big rip off.